Push Back Pallet Racking – Canadian Rack Inc.
Push Back Pallet Racking Systems operate similar to pallet flow rack in that they are also designed to utilize the natural force of gravity to move the pallets within the system; but that is where the similarities end. Each level in a Push Back Pallet Racking system holds a series of nested rolling carts which operate in a lane that slopes upwards away from the pick face. This rack acquired its name because the lift truck operator lines up in front of the first pallet and pushes against it, causing the first pallet to roll away from the pick face and expose the next cart. All carts are interlocked to prevent jamming and product damage. This type of system is called Last-In-First-Out (LIFO) inventory management. Typical systems can store pallets 2 – 6 deep, with front-only loading and unloading from a single aisle. Unlike Drive-In pallet rack, the driver never enters the system, and each lane and level, flow independently of each other, allowing you to store a variety of SKU’s without disturbing product in the other lanes. Push back rack systems can be installed against a wall and operated as a single-sided system, or located in the middle of an area and operated as a double-sided system. Because each lane flows independently, push back pallet racking allows you to store more pallets, but with better selectivity than drive-in pallet rack. Compared to standard selective pallet rack, push back racking can save you up to 90% storage space. 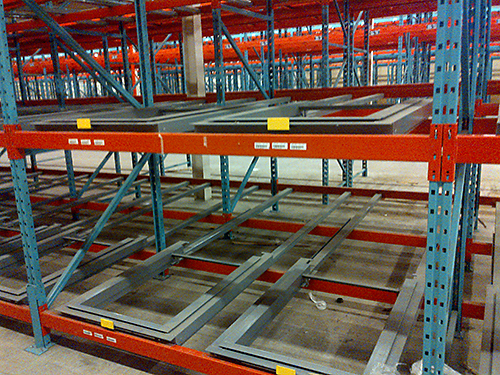 Push Back Pallet Racking allows you to store multiple SKUs on different lane levels, enabling easy access. Combined with proper warehouse management, you can maintain First In First Out (FIFO) by emptying the oldest lanes first. At Canadian Rack, safety and stability are always top priorities. Because this type of rack deals with dynamic loads, we take care to ensure that the system is more robust than if static pallets were being used.